Patton Wilson paints in egg oil emulsion, oil, egg tempera and casein. Each of these media allows him to interpret ideas in different ways. He’s a contemporary American artist who paints in the realist tradition. In his painting process, he usually begins by making color, ink or graphite studies resolving the issues of light and composition. Wilson works from life in his variety of mediums. His approach to subject matter combines a contemporary interpretation to the subject with traditional skills and techniques, giving his paintings a subtle and immediate impact. Wilson lives and is active in Virginia where he’s now considered as one of the best artists. He’s a member of the American Artist Professional League, the Allied Artists of America, the Washington Society of Landscape Painters and the Society of Tempera Painters. Wilson counts among his influences his family (wife and son) as well as the Dutch Baroque, the master painters of the Renaissance, and the American realist tradition. 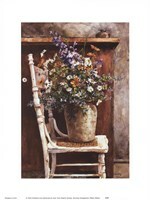 He has received several wards, including American Frame Corporation Award, Charlotte Kughler Award, The Grumbacher Gold Medal, The National Casein Painting Competition, Society of Painters in Casein and Acrylic, Audubon Artists Annual Exhibition, and American Watercolor Society International Exhibition, among others. Using a variety of media is a means through which Wilson tries to satisfy the varying needs of his clients. He believes that by doing this, he will increase the collectability of his art. That’s why his art is today found in many collections, galleries, homes and institutions around the globe.